Gwendolyn-Mary candles are 100% soy based with reusable glass containers. Layer the scents of different candles or use alone. In reality, Laccinole spent many years as a music executive before becoming a writer and professional screenwriter. That is until one day when she was “going along doing her daily routine” when suddenly this single mom of two says she came upon an inspiration to blend music and scent. “And with that thought, my ‘next life’ was promoted to NOW,” she relays. Today, Laccinole (who also happens to be a trained classical pianist) is using her skills and experience creating music and stories, but has transferred her creative talent to the formation of her own perfume and candle company, Gwendolyn-Mary, where she artfully combines scent and sound. She spent the last year back home assembling her team, sourcing glass manufacturers, designers and perfumers. Each soy based candle and the perfumes are hand-mixed and poured individually. The glass candle containers are meant to be reused. Just wash the soy wax out at the bottom and you’ve got new glassware. Candles and perfumes are virtually a dime a dozen these days, but all are not equal. Gwendolyn-Mary stands out for uniquely fresh scents, beautiful packaging, and moreover, for the creative and innovative way they are used. The company’s premiere line, “Pavane,” is based on the dignified couple’s dance that was popular during the Renaissance period of the 16th century. The line has three distinct scents for top notes, middle notes and bottom notes. 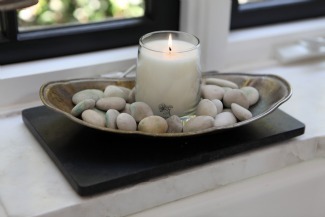 Laccinole explains that both the candles and scents can be layered and used together, or separately, so it becomes a personalized experience. Each candle comes with a note which suggests a piece of music to enjoy with the scent. Gwendolyn-Mary perfumes and candles have sophisticated, smooth, floral and earthy fragrances using scents such as orange blossom, petit grain, lychee, water lily, Moroccan Red Rose, sandalwood, oak moss and Madagascar vanilla. They do not overpower, but rather, bring forth a deliciously swirling air of calm and romance. 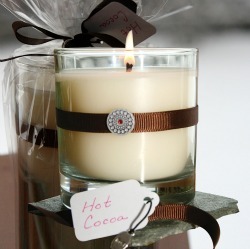 Also available are Gwennies, a whimsical line of candles produced with fun scents (such as hot cocoa, grapefruit, creme brûlée and orangesicle) wrapped in cellophane and adorned with matching ribbon and a surprise charm. Gwennie candles are full of fun and whimsy. Gwendolyn-Mary products are just hitting the market. Find these delicious scents locally at Simply Succulent and Nadia Thibault Skincare — both in Studio City. Online go to Gwendolyn-Mary direct or check out Open Sky. 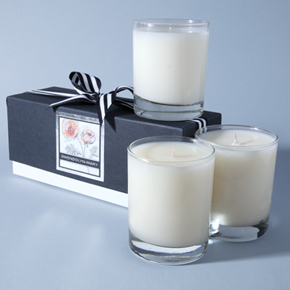 Order the candles and perfumes separately or as a Pavane set of three to layer. Custom and corporate gifts are also available through the website. For more information, go to the Gwendolyn-Mary website or Facebook. I’m not a candle person but once I got a whiff of Gwendolyn-Mary’s delicious scents, they became a staple in my home. And I’m addicted to the perfumes. They’re fun to mix and match and create your own individual fragrance. Goodbye Chanel, hello Gwendolyn-Mary! Someone gave me one of these candles along with 3 little scent bottles. Even included a snazzy little box of Gwendolyn-Mary matches. HEAVEN!!! 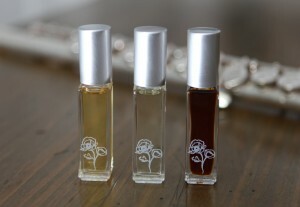 I recieved one of these perfumes as a gift. Everytime I wore it I had random men telling me I smelled great. I tracked the company down to order more. The candles rock too. The scents are amazing and they are better than the candles I used to buy at Neiman Marcus. Love this company.